This watch is exactly what I was looking for - it's two toned so it will go with everything, and it was quick and easy to adjust the size by myself. This watch is beautiful. It's light and sits flat on your wrist. Because it is a minimalist watch -you want to make make sure you shop for a watch with the right case diameter size for your wrist; otherwise the face of your watch will be too large for your wrist. It's real easy - Google the 'case diameter for your wrist size'. measure the circumference of your wrist in inches and then find out the case diameter size that goes with your measurement. Not only is this watch beautiful and but because it is so light and sits flat on your wrist it is more ergonomic. Jewelry that does not get in your way if you work with your hands. I really do like this watch, but after a few months, the dial peg fell off and water keeps going into the crystal. 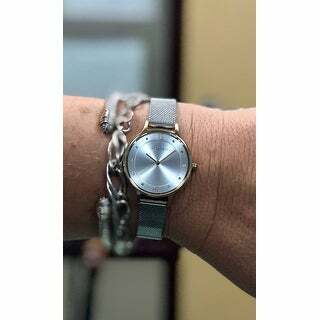 Love this beautiful 2 tone watch. It has a tiny diamond at each number on the watch. I need to take it to the jewelers to see how to make the wrist smaller and how to close it. No directions came with it. I recommend this watch! This is my third Skagen watch. I love these watches because they are light on your wrist & are so versatile they can be worn with casual or dress outfits. Would definitely recommend this product. Beautiful watch that I receive a lot of compliments on. It is my second Skagen and they are fantastic quality for the price. Love the two tone and mesh band, as they look great with everything! Mesh bracelet watches seem to be in now. This was exactly what I wanted. Perfect size. Very classy looking. I get lots of complements. Love this watch. Lightweight, large face, diamond accent numbers and secure latch. Very sleek looking and a nice change from my other watches. It looks great stacked with bracelets. Love my watch I get so many compliments...Keeps great time. I wear it all the time. I would highly recommend skagen. It is silver and gold and matches everything. I compared the price to other websites and this was the best. Also the delivery was great received it even earlier than I expected. 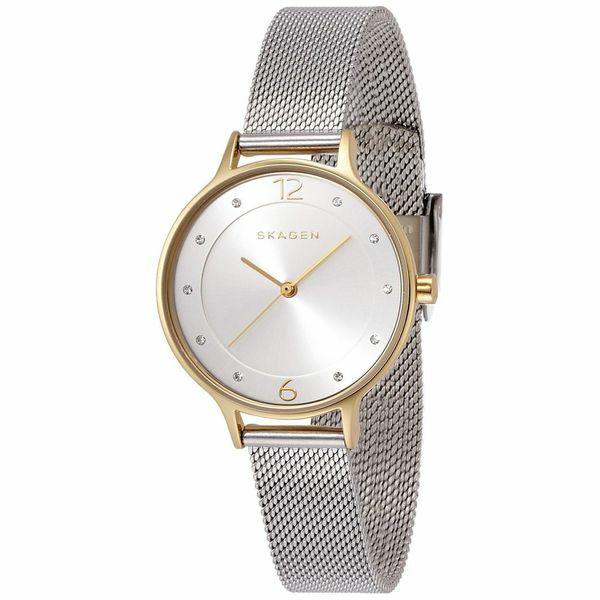 A quality Skagen product and very pretty, but the face was too large for my wrist. If it were a half inch smaller, it would have been perfect. This is the most comfortable watch I've ever worn, and it's holding up beautifully! Beautiful but not usable as clasp will not fasten. Useless. Cannot wear. Would have so loved to be able to wear this handsome watch. I like the style and Overstock had a good price.